Opening day of the major league baseball season was just a few days ago. Sheridan Park will be starting their baseball camp soon. American’s favorite pastime is upon us. Last fall I was walking south on Wood Street thru the Illinois Medical District and discovered a plaque on the grounds of the UIC Neuropsychiatric Institute (912 S Wood). 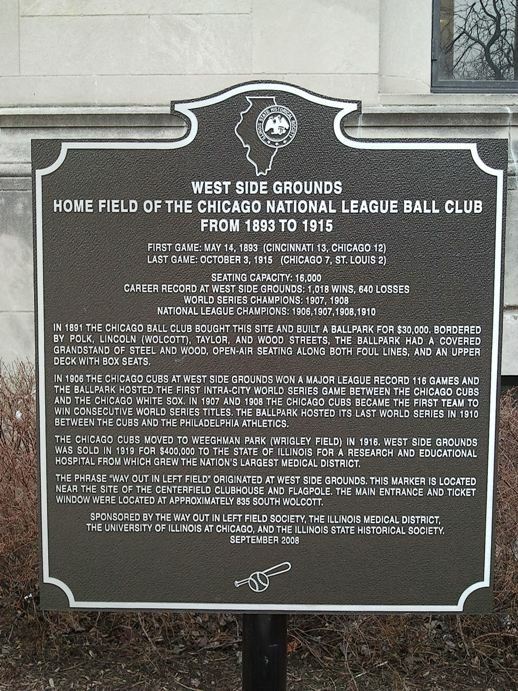 To my surprise and delight the plaque commemorates the West Side Grounds (the 2nd West Side Park), which was the home field for the Chicago National League Ball Club, better known as the Chicago Cubs from 1893 to 1915. On these hallowed grounds the Cubs WON the World Series in 1907 and 1908! They were National League Champions in 1906, 1907, 1908 and 1910. They had 1,018 wins and 640 losses in this park. Prior to moving into this park baseball was played at the 1st West Side Park from 1885 -1891. The site of this park is now occupied by the Andrew Jackson Language Academy, whose address is 1340 West Harrison. It gives a wonderful account of both ball parks plus more! May you enjoy this baseball season, whether you are sitting at a little league game, playing the game yourself, or cheering on the White Sox or the Cubs! Looking forward to lots of WINS.